Monday, 21 January 2019, 10:39a.m. She claims items from the motel room were also missing. The motel claimed teaspoons, forks, a bowl and a wine glass were missing after the family left. The hotel confirmed the family paid for their room under the name Eileen, but when asked to check out after their booking ended, they reportedly stayed put outside the room making noise and smoking. The room was booked for four adults and two children, however, when Daily Mail Australia spoke to the family there were seven people present. The incident comes just a day after a 26-year-old pregnant woman who is part of the tourists' travel party spoke out about her time in police cells in Hamilton. Tina Maria Cash was convicted and ordered to pay $55 in reparation for stolen energy drinks, rope and sunglasses last week at Hamilton District Court. 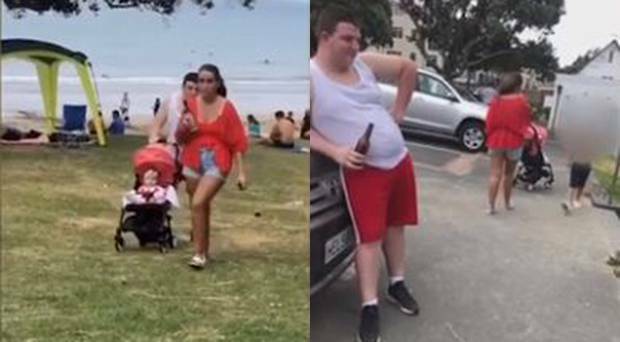 The family were filmed leaving beer bottles and piles of rubbish on Takapuna Beach. "She was held in a cell by herself overnight. Anyone who wishes to make a formal complaint can do so by reporting it to the IPCA," a police spokeswoman said. "Otherwise they were going to keep me in for two weeks and deport me." Cash also claimed she, and another family member James Johnson who was out of heart medication, were too afraid to visit a doctor.